Am I Not A Woman And A Sister? 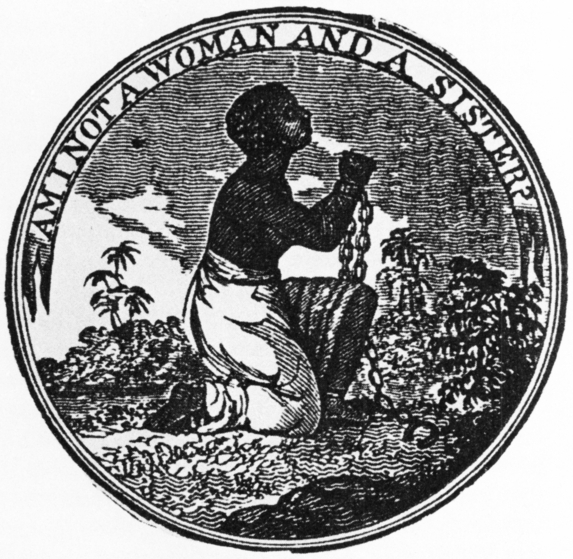 This illustration from an abolitionist book was a variation on the original 1787 seal of the British Society for the Abolition of the Slave Trade. The original organization symbol, showing a supplicant male slave, was designed by the famous British potter Josiah Wedgwood and in the form of cameos (a carved item of jewelry) became a popular personal expression of opposition to slavery in the United States. Source | George Bourne, Am I Not A Woman And A Sister?, 1838, wood engraving, Slavery Illustrated in Its Effects upon Women (Boston, 1837), from Picturing U.S. History, http://picturinghistory.gc.cuny.edu/lessons_burnsbrown1.php. Cite This document | George Bourne, “Am I Not A Woman And A Sister?,” HERB: Resources for Teachers, accessed April 20, 2019, https://herb.ashp.cuny.edu/items/show/1223.